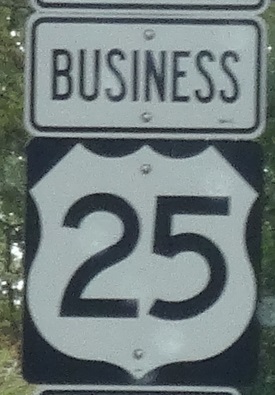 U.S. Federal Route 25 runs north-south Central Henderson County. It runs from the North Carolina/South Carolina State Line, near Travelers Rest, South Carolina, to the Henderson/Buncombe County Line, near Oak Park. U.S. Rt. 25 passes through the following towns in Henderson County. U.S Rt. 25 is multi-plexed in Henderson County. Interstate 26, from near East Flat Rock to Fletcher. U.S. Rt. 74, from near East Flat Rock to Fletcher. U.S. Rt. 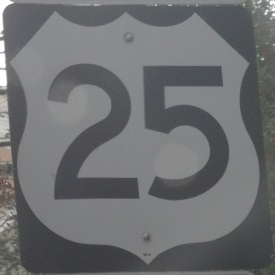 25 intersects the following highways in Henderson County. North Carolina State Route 225, near Zirconia. North Carolina State Route 225, at Zirconia. U.S. Rt. 176, near East Flat Rock. BUSN U.S. Rt. 25, near East Flat Rock. Interstate 26, near East Flat Rock. U.S. Rt. 74, near East Flat Rock. U.S. Rt. 64, at Hendersonville. U.S. Rt. 74, at Fletcher. BUSN U.S. Rt. 25, at Fletcher. Branches of U.S. Rt. 25 in Henderson County.